This is an account of a tour organised on Saturday August 17 2002 by the Belfast Naturalists Field Club. It was our intention to look at historic sites close to the River Blackwater, starting at Charlemont and finishing at Rathtrillick, just outside Middletown. About 20 members gathered in the square at the Moy with the expectation of rain but the hope of sunshine. A light drizzle refreshed us throughout the morning and prepared us for the glorious sunshine of the afternoon. The first fort and wooden bridge over the River Blackwater were built in June 1602. Charles Blount, Lord Mountjoy, named it Charlemont from his own Christian name. In it he placed a garrison of 150 men under the command of Captain Toby Caulfield, whose descendants became the Earls of Charlemont. The house which was built in the middle of the fort seems to have been a large three-storey square tower with various projections and topped by crenellations and multiple chimneys. In the early morning of July 30 1920 a body of about 40 armed men attacked the house which was then occupied only by a caretaker. They burned the house and in 1921 the ruins were sold to a contractor who sold the bricks and stones for cheap building material. The gatehouse probably dates from the late 17th century. It had a drawbridge which is now gone, as is the ditch which it spanned. Some time in the late 18th century it seems to have received a makeover. It now looks like a Classical Georgian building with a pediment and a large panel with the Charlemont coat of arms over the gateway. Inside the building much of the original stonework is intact but the floors are badly decayed. The pulleys associated with the drawbridge mechanism and the channels for the sliding counterweights are clearly visible. Portions of the outer earthen bank of the artillery fort still exist. The fort remained a government building until the middle of the 19th century when it was acquired by the Charlemont Family. They do not seem to have done much with it, probably because they were concentrating on their large house, Roxborough Castle, just on the other side of the River Blackwater. This large house was built some time in the 18th century, probably by the 1st Earl of Charlemont. In the middle of the 19th century the 2nd and 3rd Earls carried out extensive renovations and rebuilding to produce a large French-style chateau. This house was burned about the same time as the house in Charlemont Fort. Only the elaborate 19th century gates and screen survive. The village of Moy (or The Moy as it is known locally) was laid out in the 18th century by the 1st Earl and modelled on Marengo in Lombardy. It has many fine 18th century houses and a large square. Unfortunately only a fragment of the 19th century market house has survived. The parish church was built early in the 19th century. It had its main door walled up because Lady Charlemont complained about the draught in her pew. Just to the west of Blackwatertown is Clonfeacle. Very little is known about the early monastery which existed here. St Lugad, the Abbot of Clonfeacle, is said to have been an old man when St Colmcille died in 597. St Patrick met St Olcan here. The name is said to have come from one of St Patrick's teeth which was preserved here. The early remains include a plain squat cross. At first glance it seems to be the upper portion of a typical ring-headed High Cross with an unpierced ring. Closer examination shows that the sectors of the ring have different diameters and do not line up with each other. The upper portions of the ring closely resemble each other but are totally different from the lower portions. This may have been a deliberate plan of the mason or he may have been a very bad workman. This may explain why the cross is unfinished. Beside the cross is a stone with a very fine deeply incised cross with expanded terminals. The graveyard has many good 18th century gravestones. There are interesting inscriptions and some figure carving. One of the stones has a coat of arms on one side. Beneath this is a tree flanked by two figures. This is presumably a representation of the Fall of Man. On the other side is a smaller tree flanked by two angels and beneath it are two winged heads. Beneath these is the inscription. On the narrow edges and across the top are small figures in long robes, carved in relief. Similar stones can be seen in other graveyards including Donagh, Co Monaghan and Clogher, Co Tyrone. Benburb Castle was built in 1615 by Sir Richard Wingfield. At the NE and NW corners of the bawn are large rectangular flanking towers. At the SE corner is a circular tower with a stair down to a postern gate. The 19th century house in the southern half of the bawn is privately occupied and there is no evidence that an early house was built on the site. It is thought that the two rectangular towers, with rooms at three levels and fireplaces, would have provided comfortable accommodation. Shane O'Neill's castle may have existed close by, possibly a short distance to the east. This area now contains a cemetery associated with the Servite Priory. Beside it is a small stone building which may have been a mortuary house. The small mound beside this building contains some large stones which may have suggested the former presence of a castle. Benburb was an important defensive outpost of the O'Neills of Tyrone and became an equally important stronghold for the English at the end of the 16th century. In 1646 Owen Roe O'Neill routed an English and Scottish army under General Munroe about 3km west of Benburb. Fighting continued in the area until Cromwell's fierce campaign of 1649. In the parish church there is a memorial to Captain James Hamilton who was killed in the battle of 1646. The Servite Priory of Our Lady of Benburb has been established in the Victorian mansion built for the Bruce Family in 1887. It was designed by William Henry Lynn. Navan Fort, or Eamhain Macha, was the chief residence of the Kings of Ulster. It was tradionally destroyed by fire in 332 AD. A huge, almost circular, enclosure of over 12 acres occupies the summit of a low hill. It has a broad ditch inside a large bank. In the NW sector of the enclosure is a large mound. Excavation has shown evidence of occupation from the middle of the 1st millennium BC. At one time there was a massive structure built of concentric rings of tall posts around a central post. This structure was filled with stones and burned. A mound of sods and clay was built over the resulting cairn. There have been some excavations recently at Navan which have uncovered what may be a paved entrance to the enclosure from the north east. We await developments. Caledon Market House was built about 1830. It is a simple two-storey structure which originally had a four-bay arcade and a small central doorway. In the yard in front of the building is a weigh-bridge with an interesting shelter. The court house was built about 1822 and probably designed by William Murray. The town had a large flax mill but only fragments remain. The base of the mill chimney is still in place and some of the workers' houses have been recently refurbished. 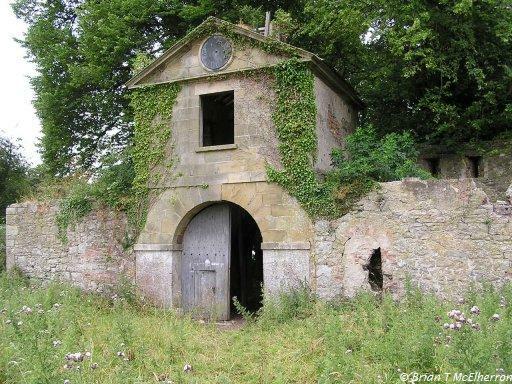 The entrance to nearby Caledon House has a twin pair of gate lodges designed by John Nash in 1812. Caledon House was built by James Alexander, 1st Earl of Caledon, in 1779 to a design of Thomas Cooley. In 1812 it was enlarged and embellished to a design of Nash. Tynan Railway Station may date from about 1858 and may have been designed by William George Murray, who designed similar, though less elaborate, stations at Newtownbutler, Lisnaskea and Lisbellaw. It has steeply pitched roofs, and originally a low spire, giving it a church-like appearance. The design may have been influenced by nearby Tynan Abbey. Tynan and Glaslough Stations were the closest railway stations to Caledon until 1887 when the Clogher Valley Railway was built. The CVR ran from Tynan to Maguiresbridge and was closed in 1941. The GNR(I) line through Tynan closed in 1957. Despite the passage of time railway stations on the CVR can still be seen at Aughnacloy, Augher, Fivemiletown, Colebrook and Brookeborough. Stations on the GNR(I) line from Armagh to Monaghan can still be seen at Killylea, Tynan, Glaslough and Monaghan. At the end of the lane leading up to the railway station is Tynan Mill. It was built by Sir James M Stronge in 1844. The Stronge Family owned Tynan Abbey. The mill was powered by a large metal waterwheel at the west end. At the south were two stationary steam engines. One of these was made by Swinson's Engineering Works, Prince's Street, Belfast. Little is known about the early monastery at Tynan. The Village Cross is a composite of two crosses, moved to its present position in 1844. The head of the cross has five bosses on each face. On the east face of the lower shaft is a panel showing the Fall of Man and on the west face is another panel showing a large figure with smaller figures behind. Some panels on the narrow faces have interlacing. There are carved fragments of other crosses at the gateway of the churchyard nearby. These include part of the decorated ring of a cross and a complete pyramidal base. On top of the gatepost is a strange stone. It is cubic with a circular hollow covering most of each face (only 5 faces are visible). It is considered to be a type of sundial dating from the 17th century. 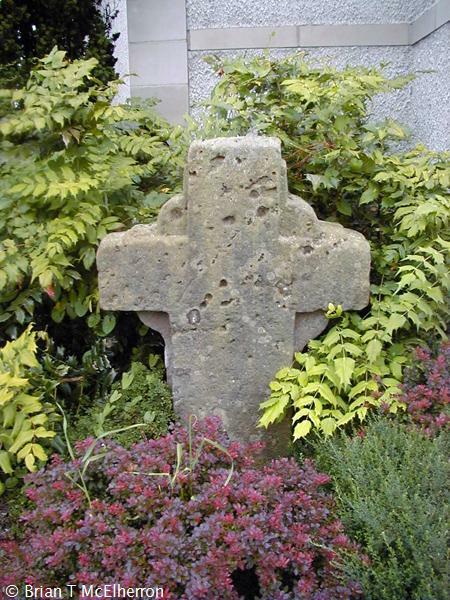 In Tynan Abbey Demesne there are three crosses: the Island Cross, which was moved from Tynan Churchyard in 1844; the Well Cross and the Island Cross, which were moved from Glenarb, Co Tyrone in 1844. Glenarb was reputed to have had seven crosses. Tynan Churchyard has many interesting monuments including a fine cast iron and bronze structure. Unfortunately by the time we had explored the Churchyard it was close to 5.30 p.m. Hunger and home began to call and we decided to leave Middletown Market House and Rathtrillick until another day.